Many travelers perceive the California desert as little more than a desolate wasteland, inhabited by a monotonous expanse of creosote bush (Larrea tridentata). In spending time off the beaten path, with a greater attention to detail, one uncovers an amazing diversity of plant life which exhibits a fascinating array of adaptations to the challenges of surviving in the desert. 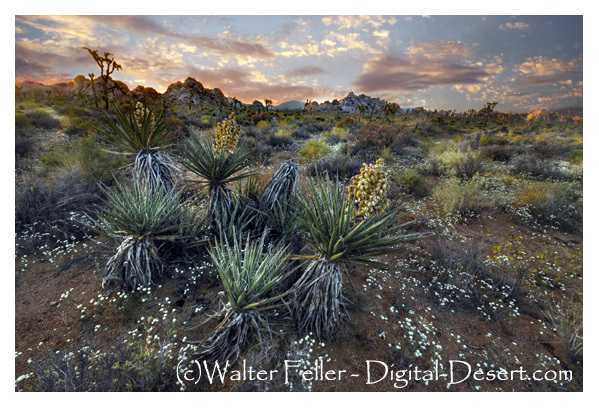 Variations of climate, substrate, and elevation support a mosaic of different vegetation associations, with many of the species found only here in the California Desert ecoregion. The flora of the California deserts as we see it today is of relatively recent origin, developing in response to rapid drying and warming trends over the past 10,000 years. Species now restricted to the high elevations of the desert mountains, such as pinyon pine (Pinus monophylla, P. edulis) and juniper (Juniperus spp. ), were widespread throughout the lowlands when the dry basins contained freshwater lakes. The heat- and drought-tolerant species that dominate today’s desert landscapes were confined to the lowest elevations and more southerly latitudes before expanding their ranges with increasing temperatures and decreasing rainfall. Saltbush Scrub and Shadscale Scrub.